Virgin Orbit are in the final stages of testing and preparation for LauncherOne, a two-stage, expendable, LOX/RP-1 rocket that launches from a dedicated 747-400 carrier aircraft, called Cosmic Girl. While the UK us a world leader in producing satellites, the UK does not have any way of actually getting them into space itself, this will help rectify that. The UK announced last weekend too that it intends to build a launch site in Scotland sometime in the early 2020s. Cosmic Girl will carry LauncherOne to an altitude of approximately 35,000 feet before release for its rocket-powered flight to orbit. Starting each mission with an airplane rather than a traditional groundbased launch pad offers performance benefits in terms of payload capacity, but more importantly, air-launch offers an unparalleled level of flexibility say Virgin Orbit. LauncherOne will operate from a variety of locations independently of traditional launch ranges—which are often congested with traffic—and will have the ability to operate through or around weather conditions and other impediments that delay traditional launches. LauncherOne will deploy customers satellites into their desired orbit. 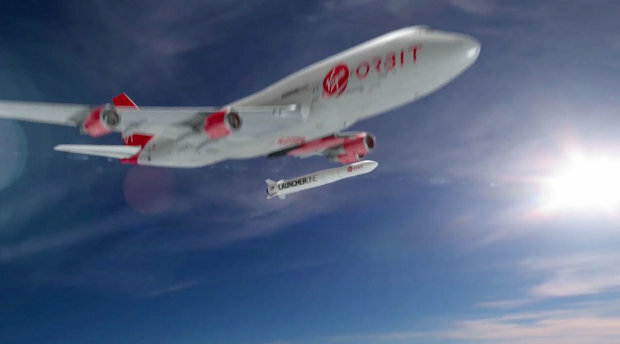 Both stages of LauncherOne will be safely deorbited say Virgin Orbit, while the carrier aircraft will return to a predetermined airport, where it can be quickly prepared for its next flight. 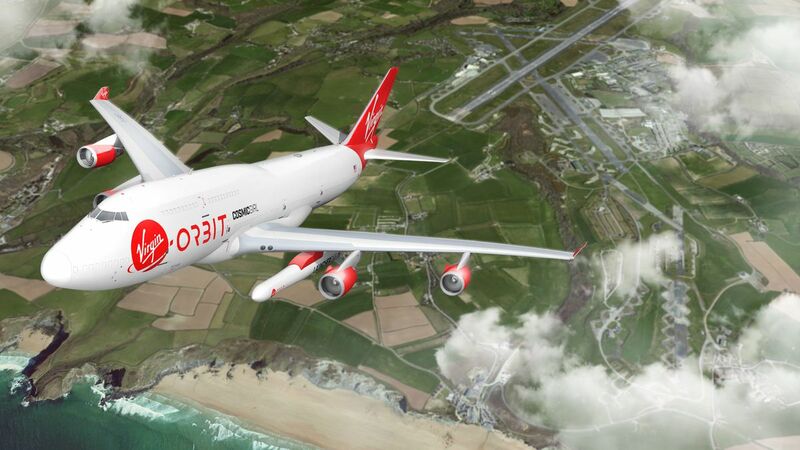 Cornwall Airport Newquay, south-west England, has been chosen by satellite launch company Virgin Orbit as its new Brit launch base. LauncherOne is capable of delivering 300 kilograms to a 500 kilometer Sun-Synchronous Orbit. The old RAF St Mawgan. You can find some pictures of it online, its a monster. Its already built but has yet to make its first flight. It will have a 550,000 pound payload, and considerably larger wingspan than anything else ever built. I fear it will be obsolete before it launches its first rocket though as Space X’s prices continue to drop. That’s a BIG aircraft. It could have lots of uses. Exactly. Big wings and lots of thrust to get lift and power to get as high as possible for whatever payload rating is achievable and not much else needed really. Even with the initial 747 solution though it’s really nice to see the UK getting a home-soil sovereign launch capability, two in fact given the vertical launch site being built in Scotland although right now I don’t think there’s a UK vertical launch vehicle ready to fly but there are a few projects in the pipeline so hopefully just a matter of time on that last bit. Certainly plenty of scope for development at St Mawgan. The ongoing military presence there is non flying although aircraft both RAF and NATO are regular visitors and successfully utilise the large (reasonably uncongested) runway and apron space. The civil airport is the UK’s fastest growing at present, albeit from a low base, which might be a problem further down the track. For now however, adding a space launch facility to existing operations will be great for the UK and Kernow. Looking forward to it. ‘airplane’, ‘deorbited’. Can you not at least try English. The same thoughts went through my mind with airplane, wasn’t sure whether I was being too nitpicky. True, it has been done before, but not from the UK. I’m suprised Virgin aren’t using the WhiteKnight2 to launch the rocket as that was supposed to go to 60,000ft. I still think this is just a stop gap until an aircraft powered by Reaction Engines Sabre combination engine is produced. There’s talk of lengthening the runway at St.Mawgen to accommodate these type of aircraft. The market will be lost if Reaction Engines don’t get a move on. We should develop our own rockets like other countries do, not just buy American ones. Space is an industry of the future we should invest in making our own rockets to carry payloads into space. We make practically nothing of our own compared with other countries.